WEDNESDAY, Jan. 6, 2016 (HealthDay News) -- A targeted cancer drug appears to be effective against advanced kidney cancer, although its side effects may keep it from becoming widely used, researchers report. The drug, cabozantinib, proved more effective across-the-board in kidney cancer patients than another targeted drug called everolimus, said lead researcher Dr. Bernard Escudier. He is chair of the genitourinary oncology committee at the Institut Gustave Roussy in Villejuif, France. Overall, cabozantinib provided "almost a 50 percent improvement in progression-free survival" over everolimus, Escudier said. Cabozantinib works by interrupting several different cellular processes that help cancer grow and spread, Escudier explained. Unfortunately, that widespread approach also creates worrisome toxic side effects, he added. "Based on this multi-targeted action, we have quite a lot of side effects. Toxicity has been an issue with this drug, leading to a decrease in the dosing in many patients," he said. Diarrhea, fatigue and nausea are the most common side effects, the study found. Escudier believes that cancer doctors likely will choose another drug, nivolumab, over cabozantinib as a follow-up option if initial chemotherapy treatment doesn't work. Nivolumab works by spurring the immune system to attack cancer cells. "I think people are going to use nivolumab as a second-line in most patients and keep cabozantinib for nivolumab failure," he said. Nivolumab's side effects aren't as serious, he explained. Escudier and his colleagues presented their findings Monday at the American Society of Clinical Oncology (ASCO) meeting in San Francisco. Findings presented at meetings are generally viewed as preliminary until they've been published in a peer-reviewed journal. Cabozantinib (Cometriq) is currently FDA-approved for treatment of patients with a specific form of thyroid cancer, the researchers said. But, it's also being tested for many different cancer types, they added. 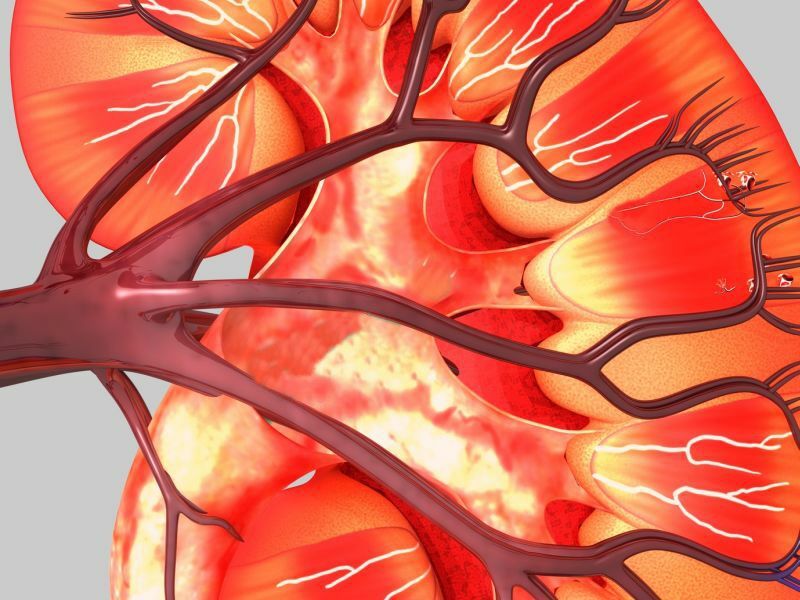 The current trial included more than 650 people with advanced renal cell carcinoma -- the most common form of kidney cancer. They were randomly assigned to receive cabozantinib or everolimus. All of the patients had been previously treated with drugs aimed at blocking the spread of nourishing blood vessels into cancerous tumors. The study found that cabozantinib kept cancer from progressing an average of 7.4 months. That was nearly double the 3.8 months achieved with everolimus, the researchers said. Cabozantinib proved effective for patients facing a number of different problems, including the spread of the cancer to bone and other organs, the prior failure of other drugs to help, and an overall poor prognosis. In addition, three out of four patients treated with cabozantinib experienced tumor shrinkage. Only half of those treated with everolimus had a reduction in their tumor size. An early look at overall survival showed a trend for improved survival for patients receiving cabozantinib compared to everolimus. "The magnitude of benefit that patients get from cabozantinib far exceeds, in my opinion, what we've seen to date in this setting, in terms of both delay in tumor growth and in improving survival," said Dr. Sumanta Pal, an ASCO expert and an oncologist at City of Hope in Duarte, Calif. "Patients who received cabozantinib had nearly double the delay in cancer growth." Because of the drug's effectiveness, Pal disagreed with Escudier over whether cancer doctors will choose cabozantinib as a second-line rather than third-line treatment. "I would perhaps tend to favor that as a second-line option, as compared to nivolumab in that setting," Pal said. "The data for cabozantinib truly speaks for itself." The clinical trial received funding from the drug company Exelixis, which makes cabozantinib. Cabozantinib is a costly medication, with prices running around $13,000 for a several month supply, according to information from the manufacturer. However, the actual price someone pays will vary depending on insurance. The manufacturer also offers assistance plans for those having difficulty paying for the medication (with or without insurance), according to the drug's website.